Consistency and reliability of experienced resources. Nityo has dedicated consultants who provide consistency of service and internal training programmes that maintain and replenish their skills and expertise. Talented consultants who can assist in all aspects of implementations and can provide complete project resources ranging from junior consultants at competitive rates, to senior business/technical analysts, developers and project managers either as complete teams or as individuals to augment existing projects. By optimizing solutions, minimizing errors and streamlining processes. Enables it to deploy resources world-wide at short notice and can draw upon an extensive talent pool as short term needs arise. Nityo offers a hybrid delivery model through a mix of On-shore and Near Shore services. 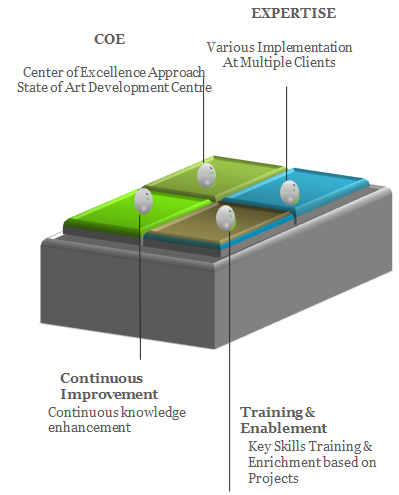 This approach reduces the TCO of client’s Projects implementations.